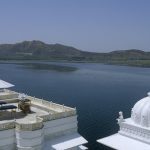 The Lake Palace, built in the 17th century on a natural foundation of 4 acres of rock, is one of the most beautiful palaces in the world, rising out of the turquoise waters of Lake Pichola like an elegant fantasy in white marble. 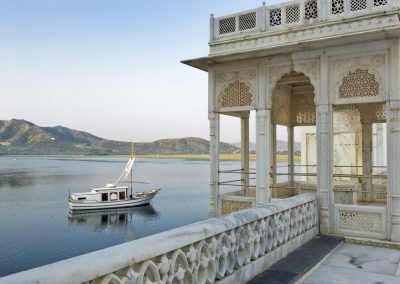 This cool haven was used by rulers as their summer resort, holding their regal durbars in its courtyards lined with columns, pillared terraces, fountains and gardens. The rooms are decorated with cusped arches, inland stones of pink, and green lotus leaves and painted mirrors. 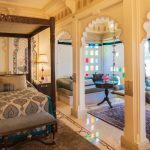 This heritage hotel has 66 luxurious rooms and 17 grand suites. 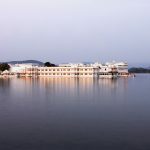 Its location on an island in the midst of a lake affords every room breathtaking views of the neighbouring City Palace, Aravalli Hills, Machla Magra Hills and Jag Mandir. 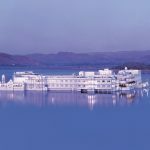 Where else can you meet at a palace in the middle of a lake. Get ready to feel the weight of the world leave your shoulders with an indulgent experience at Taj Jiva Spa. The select range of exquisite services include beauty and wellness treatments that befit royals. The best ingredients are offered to you for everything from glowing skin to a rejuvenated mind and body. Whatever you choose to indulge in, the experience will leave you deeply refreshed and renewed all over. 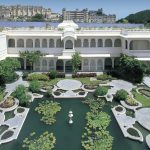 Other facilities include a swimming pool, conference hall, a lobby with jewellery and souvenir shops, Secretarial service, mini gym, currency exchange, safe deposit lockers, a doctor, and baby sitting.